WINONA, MINN., USA – PlastiComp, Inc., a global leader in long fiber thermoplastic (LFT) materials and technologies, recently revealed the enhanced aesthetic capabilities of its Velocity® high flow nylon long fiber reinforced composites. The products simplify the injection molding of high fiber content LFT components by more easily producing the smooth, fiber-free finish desired on external surfaces. PlastiComp developed its Velocity series of high flow nylon (polyamide) 6 and 66 LFT composites to facilitate easier and quicker molding of high glass or carbon fiber content materials. Standard LFT materials with fiber loadings of 50% or above exhibit high viscosity characteristics which can make them problematic to mold, especially in thin wall sections. With standard high fiber content materials, higher molding temperatures are required to obtain a resin-rich surface, which results in slower cycle times and increased operating costs. When using PlastiComp’s Velocity long fiber grades, enhanced, fiber-free surfaces are obtainable at 30-40°F (17-22°C) lower processing temperatures. A smooth to the touch, resin-rich surface free of fibers makes colors appear more vibrant and is capable of holding finer embossed details – such visual characteristics are important to establishing high product quality perceptions among consumers. 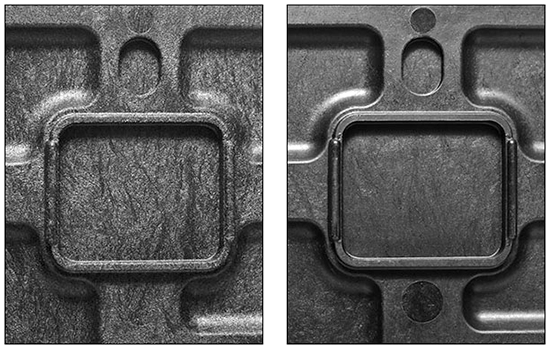 3X images show (left) the surface finish of a standard 50% long glass fiber nylon 66 composite with fibers present on the part surface and (right) the surface finish of a Velocity® 50% long glass fiber nylon 66 composite with its smooth, fiber-free surface finish that is better able to hold fine details. Both samples were injection molded using the same processing conditions. For more information on Velocity® high flow nylon (PA) long fiber reinforced composites or other LFT products and technologies available from PlastiComp, please call +1 507-858-0330, e-mail info@plasticomp.com, or visit their website at www.plasticomp.com.